Baby hunting and fishing clothes are on many parents' clothing lists. Are babies really hitting the lakes and forests to hunt and fish? Probably not. However, today's hunting and fishing outfits for kids are simply must-have fashion trends that many parents adore. Baby fashion trends are just as changeable as teen and adult clothing fads, and baby hunting and fishing clothes have hit the apparel market full force. Why do parents love hunting and fishing clothes for babies? For many, the answer is simple. Camouflage items are just so cute! There are other reasons as well, though. Most hunting and fishing fashions for little ones involve shirts, pants, jackets, and overalls made of sturdy, durable material. While newborns may not do much damage to their clothing, toddlers can really put their clothes through the wringer as they run, jump, leap and fall over and over throughout each day. Cotton and cotton blends, durable canvas, denim, corduroy and duck cloth make hunting and fishing baby attire the perfect choice for everyday wear. Not only are these clothes durable, but they should be comfortable as well. When it comes to style, the sky's the limit. No longer are baby hunting and fishing clothes relegated to the traditional greens, tans and browns. Today's camo clothing comes in a variety of colors lending a funky look to a basic design. Little girls can get in on the outdoors' look with camouflage pants, shirts, skirts, jackets, hats and even dresses. Look for fun colors in pinks, purples, blues and more. Embellishments could include monogrammed initials or embroidered designs of flowers, animals, etc. Pair a solid color T-shirt with camo pants, or top a sweet dress with a hot pink camo jacket and jaunty hat to match. Choose T-shirts and pants that feature fish and other animal designs as well. Boys no longer have to be satisfied with the traditional camo colors either. Instead, look for color combos like black and blue, blue and green, black and white, brown and white, and red and gray, among others. For your baby boy, pair a black T-shirt with black and white camo pants and black or white tennis shoes. As an alternative, choose pants and a shirt that match and add a solid color hat to the mix. 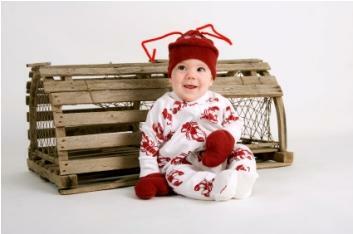 No matter what type of baby hunting and fishing clothes you buy, you'll still want to look for comfort. Babies don't like to be dressed in stiff, confining clothes, and this holds true for outdoor clothing as well. If you purchase one-piece items, like coverall, overalls and onesies, be sure to allow enough room for easy movement. Ideally, the overalls or coveralls you purchase will have two or three snap options that you can change as your baby grows. Remember to allow room for a diaper, too, when you purchase one-piece outfits. Where can you find fishing and hunting clothes for baby? The Internet has many sites that offer a wide variety of outdoor clothing for infants and toddlers. Check the sizing charts of these sites, however, before placing your order, and you should also familiarize yourself with each company's shipping and return policy. Just Camo - You'll find flee pajamas, diaper covers, onesies, mitten and hats, and other accessories. Bass Pro Shops - Choose from bib overalls, infant and toddler caps, high top boots, jackets, diaper covers, booties, bibs, when you shop online at the Bass Pro Shop. Cabela's - Choose from casual wear to outdoor wear for infants and toddlers in Cabela's large selection of hunting and fishing clothes. Finally, as your baby grows, you can still find plenty of hunting clothes perfect for kids of all ages. Have fun dressing your child in fun and funky camo clothing and watch the smiles of everyone who sees him or her.